DNA testing is currently the most advanced and accurate technology to determine parentage. In a DNA parentage test, the result (called the 'probability of parentage)[not in citation given] is 0% when the alleged parent is not biologically related to the child and the probability of parentage is typically 99.99% when the alleged parent is biologically related to the child. 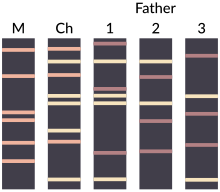 However, while almost all individuals have a single and distinct set of genes, rare individuals, known as "chimeras", have at least two different sets of genes, which can result in a false negative result if their reproductive tissue has a different genetic make-up from the tissue sampled for the test. The testing is performed by collecting buccal cells found on the inside of a person's cheek using a buccal swab or cheek swab. These swabs have wooden or plastic stick handles with a cotton on synthetic tip. The collector rubs the inside of a person's cheek to collect as many buccal cells as possible. The buccal cells are then sent to a laboratory for testing. For paternity testing, samples from the alleged father and child would be needed. For maternity testing, samples from the alleged mother and child would be needed. It is possible to determine who the biological father of the fetus is while the woman is still pregnant through procedures called chorionic villus sampling or amniocentesis. Chorionic villus sampling retrieves placental tissue in either a transcervical or transabdominal manner. Amniocentesis retrieves amniotic fluid by inserting a needle through the pregnant mother's abdominal wall. These procedures are highly accurate because they are taking a sample directly from the fetus; however, there is a small risk for the woman to miscarry and lose the pregnancy as a result. Both CVS and Amnio require the pregnant woman to visit a genetic specialist known as a maternal fetal medicine specialist who will perform the procedure. Current advances in genetic testing have led to the ability to determine who the biological father is while the woman is still pregnant through a non-invasive method. There is a small amount of fetal DNA (cffDNA) present in the mother's blood during pregnancy. This allows for accurate fetal DNA paternity testing during pregnancy from a blood draw with no risk of miscarriage. Studies have shown that cffDNA can first be observed as early as 7 weeks gestation, and the amount of cffDNA increases as the pregnancy progresses. The DNA of an individual is the same in every somatic (nonreproductive) cell. Sexual reproduction brings the DNA of both parents together randomly to create a unique combination of genetic material in a new cell, so the genetic material of an individual is derived from the genetic material of both their parents in equal amounts. This genetic material is known as the nuclear genome of the individual, because it is found in the nucleus. In Brazil in 2019, two male identical twins were ordered to both pay maintenance for a child fathered by one of them but the father could not be identified with DNA. In the United Kingdom, there were no restrictions on paternity tests until the Human Tissue Act 2004 came into force in September 2006. Section 45 states that it is an offence to possess without appropriate consent any human bodily material with the intent of analysing its DNA. Legally declared fathers have access to paternity-testing services under the new regulations, provided the putative parental DNA being tested is their own. Tests are sometimes ordered by courts when proof of paternity is required. In the UK, the Ministry of Justice accredits bodies that can conduct this testing. The Department of Health produced a voluntary code of practice on genetic paternity testing in 2001. This document is currently under review, and responsibility for it has been transferred to the Human Tissue Authority. In the 2018 case of Anderson V Spencer the Court of Appeal permitted for the very first time DNA samples taken from a Deceased person to be used for paternity testing. DNA paternity testing is solely performed on decision of a judge in case of a judiciary procedure in order either to establish or contest paternity or to obtain or deny child support. Private DNA paternity testing is illegal, including through laboratories in other countries, and is punishable by up to a year in prison and a €15,000 fine. The French Council of State has described the law's purpose as upholding the "French regime of filiation" and preserving "the peace of families." Peace-of-mind parentage tests are widely available on the internet. For a parentage test (paternity or maternity) to be admissible for legal purposes, such as for changing a birth certificate, Family Law Court proceedings, visa/citizenship applications or child support claims, the process undertaken needs to comply with the Family Law Regulations 1984 (Cth) . Further, the laboratory processing the samples must be accredited by the National Association of Testing Authorities (NATA) . In China, paternity testing is legally available to fathers who suspect their child is not theirs. Chinese law also requires a paternity test for any child born outside the one-child policy for the child to be eligible for a hukou, or family registration record. Family tie formed by adoption can also only be confirmed by a paternity test. A large number of Chinese citizens seek paternity testing each year, and this has given rise to many unlicensed illegal testing centers being set up. ^ Pollack, Andrew (June 19, 2012). "Paternity Blood Tests That Work Early in a Pregnancy" – via NYTimes.com. ^ "Paternity Indices". April 19, 2004. Archived from the original on April 19, 2004. ^ "Two Women Don't Match Their Kids' DNA". Abcnews.go.com. August 15, 2006. Retrieved April 3, 2010. ^ Guo, Xin; Bayliss, Philip; Damewood, Marian; Varney, John; Ma, Emily; Vallecillo, Brett; Dhallan, Ravinder (2012). ""The New England Journal of Medicine "A Non-invasive Test to Determine Paternity in Pregnancy" May 3, 2012". New England Journal of Medicine. The New England Journal of Medicine. 366 (18): 1743–1745. doi:10.1056/NEJMc1113044. PMID 22551147. ^ "The New York Times "Before Birth, Dad's I.D." June 20, 2012". The New York Times. ^ Gjertson, David W.; Brenner, Charles H.; Baur, Max P.; Carracedo, Angel; Guidet, Francois; Luque, Juan A.; Lessig, Rüdiger; Mayr, Wolfgang R.; Pascali, Vince L.; Prinz, Mechthild; Schneider, Peter M.; Morling, Niels (2007). "ISFG: Recommendations on biostatistics in paternity testing". Forensic Science International: Genetics. 1 (3–4): 223–231. doi:10.1016/j.fsigen.2007.06.006. ISSN 1872-4973. PMID 19083766. ^ "History of DNA Testing - DNA Diagnostics Center". ^ "The Tuscaloosa News - Google News Archive Search". news.google.com. ^ a b "Paternity Testing Resources". November 19, 2004. Archived from the original on November 19, 2004. ^ "DNA and Parentage Blood Testing". March 22, 2005. Archived from the original on March 22, 2005. ^ "Genetic Relationship Testing" (PDF). ^ Cockburn, Harry (April 3, 2019). "Identical twins both ordered to pay child support after DNA tests fail to determine who baby's father is". The Independent. Retrieved April 4, 2019. ^ "Accredited Parentage Testing Facilities". February 18, 2006. Archived from the original on February 18, 2006. ^ "Paternity Test - CanadianDivorceLaws.com". www.canadiandivorcelaws.com. ^ "Fast, 100% Accurate AABB DNA Paternity Test - Philippines". dnahustisya.ph. ^ "BIONEWS - Germany passes genetic test laws". www.bionews.org.uk. ^ (www.dw.com), Deutsche Welle. "Constitutional Court Rules Secret Paternity Tests Still Illegal - Germany- News and in-depth reporting from Berlin and beyond - DW - 13.02.2007". DW.COM. ^ "Court Orders Paternity Test Despite 'Mamzer' Factor - Israel National News". Israel National News. ^ Sinai, Ruth (October 22, 2008). "Court May Side With Husband on Paternity Test" – via Haaretz. ^ Ilan, Shahar (July 24, 2008). "MKs Okay Paternity Testing" – via Haaretz. ^ "AFP: Paternity tests take off in Spain thanks to French ban". February 10, 2013. Archived from the original on February 10, 2013. ^ "Spain Offers Paternity Tests to Suspicious French Fathers". Medindia. ^ a b "China's census gives rise to paternity test, distrust; netizens' comments and our thoughts - Ministry of Tofu 豆腐部". www.ministryoftofu.com. This page was last edited on 4 April 2019, at 13:54 (UTC).